We’ve been super busy since February. Derrick’s been up to the lodge 4 times, and I’ve managed to make it there twice. The last 2 times we hauled in everything from new roofs and a tractor to redo the airstrip to a quartz countertop, 9 boats, and a 1,000 gallons of fuel for the boats and generators. 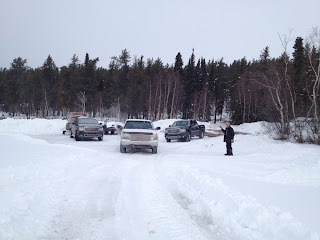 Choosing and buying floors for the cabins, tile, faucets, and showers for the bathrooms, countertops and cabinets for the kitchen, and all the other miscellaneous stuff you need to run a lodge takes a long time. The coolest and most useful thing we’ve hauled in so far is the Argo. We’ve also become mechanics in the process. When something breaks in the middle of nowhere, you figure out how to fix it yourself pretty quick. 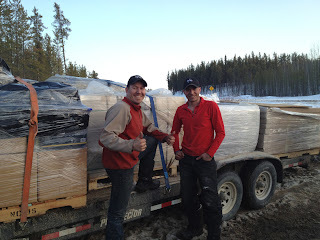 In the middle of all this craziness—and trust me, the logistics of getting three 48 foot trailers and twenty 18 foot trailers filled to capacity to the middle of nowhere, unloading them, and driving the content across 20 miles of floodwater-covered ice road is crazy, not to mention the Visa bills—we keep saying to each other how amazing it is that we get to live this dream. And even better, how amazing it is that we get to do it together. 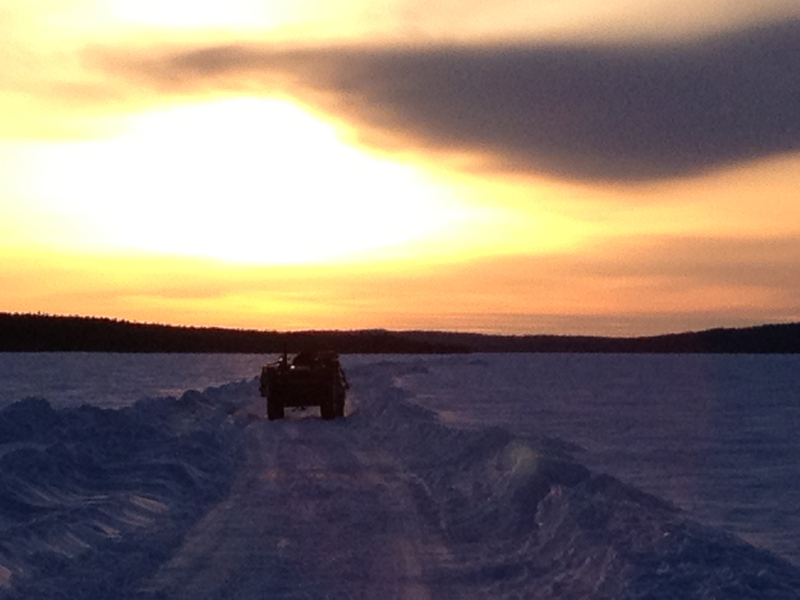 Riding off into the sunset...to clear more snow. We won’t talk about the relief of not falling through the ice (we only broke through a few times), or the jittery adrenaline rush when you hit a patch of floodwater on the ice road. 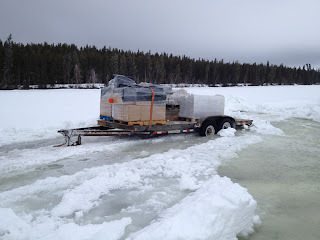 Each time we managed to get the trucks across the ice into the lodge, there was such a sense of accomplishment. 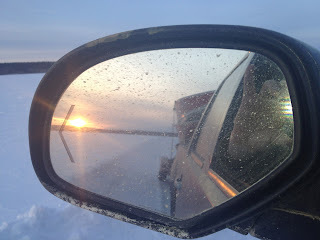 Owning a lodge is all brand new to us, but I hope we keep the sense of wonderment at our new reality as the years go by. Getting all three trucks to the lodge was a proud moment. The busy-ness continues as we get ready to start the real work in the beginning of May, and to welcome our very first clients on May 24th. We’ll be at the Fort McMurray trade show next weekend too. If you’re there, stop in and say hi. We’d love to tell you more about our adventures so far. We can’t wait for what I’m sure will be the best fishing season of our lives so far. Last day; last load. Dirty, but so happy!